On December 11th, 2014, the RoboLancers that were going to the competition met in 95, and received their team tshirts. The whole team left, but when they noticed the kid in the wheelchair was missing, everybody stopped and wondered where the kid was at. Furthermore, as the wheelchair kid got on the subway’s elevator, the whole team left without Mr. Johnson and the wheelchair kid as they watched the train doors close before them. That kid was me. Things got better when we got there, though. As both Crimson and Gold traveled (nervously) to Temple University’s Engineering building to compete in our first FTC meet. The experience of the meet as a whole was amazing. Despite not being fully prepared, that did not discourage nor stop us from doing our best. 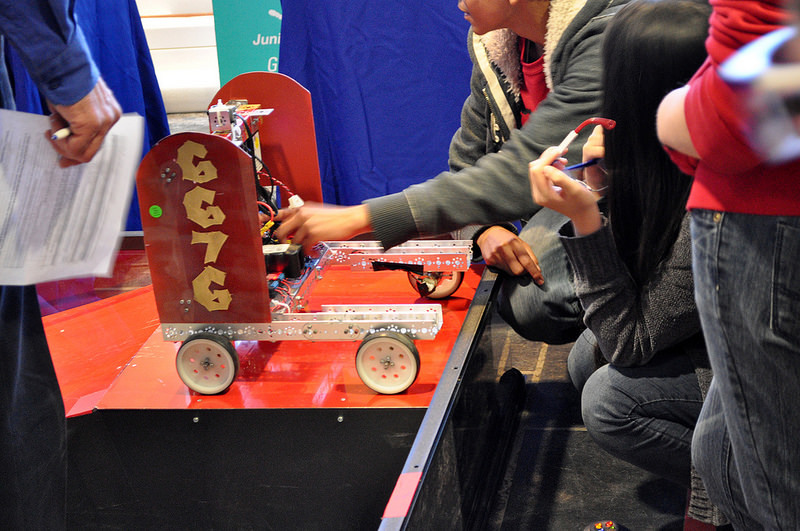 Our first instinct when we got there was to put the finishing touches on the robot. Crimson went to one table and gold to another and we immediately went to work. Crimson immediately panicked because they have realize that we didn’t have a supply list and the manipulator didn’t turn out as expected. 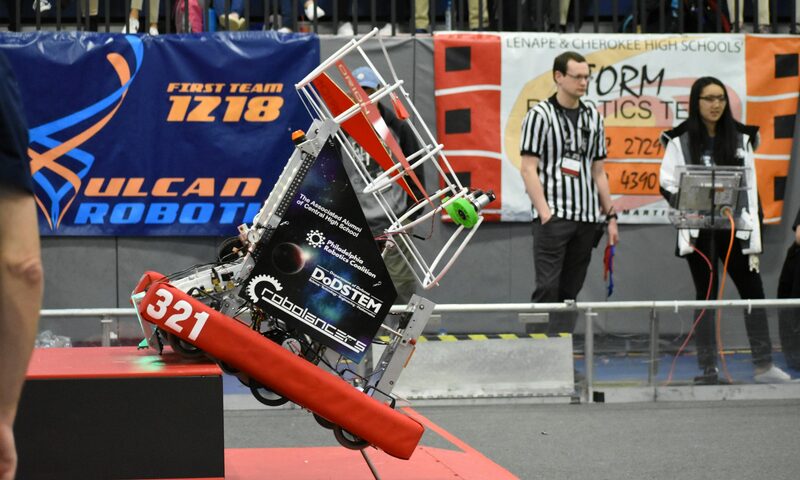 As the competition went on, Crimson realized that their robot was back heavy, and had to reprogram the robot to make it effectively. As some people worked on the robots, others went to scout the competition From the interviews, we learned a bit about the teams that were there. Based on what we witnessed that day, we saw flaws and strengths within teams. This also made us realize our own flaws and strengths as well. Our teleoperated code seemed to be defective when testing even though it worked before, when suddenly, Armond, programming Lead, came around and read through and noticed that the controller was defective and our code was actually”A-Ok”. The programmers there, Viwing and I, had a nervous breakdown when we thought our autonomous code did not work, but the answer to the problem was a quick fix. We just needed to activate the code by selecting it in the NXT Brick. As we went into the matches, our batteries were always scarce and hardly available due to the high demand from Gold needing the batteries for their match when we were practicing it. In the end since there was only one battery, but they relied on us and we pulled through that match with a close win. Previous PostPrevious Thanks Central Home and School Association!